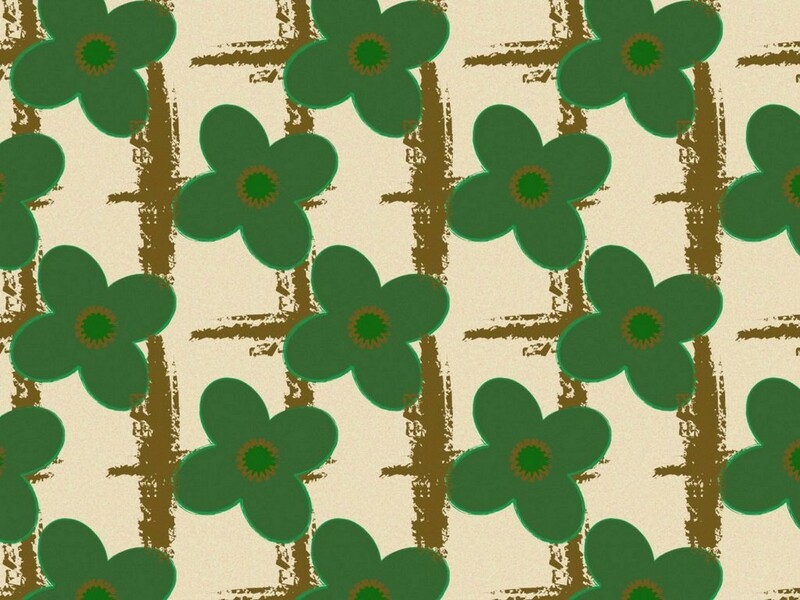 We have moved forward a few years to the early 1970s for this extremely pleasant and practical mid-century pattern. The 1970s, and the late 1960s, may have been a time of riotous excess in many areas but in terms of fashion fabrics for the average woman very little changed and any change was quite gradual. This design, although from the early 70s, could easily have come from the preceding decade. Whilst those at the height of fashion were stretching boundaries the vast majority of people were slow to catch up, this situation began to change at the end of the decade. Once again this design was made in Adobe Illustrator and the image was created in Daz 4.7 using the same model and background that I have used recently. I have to apologise to my model since I now realise that the girl is Madeline and not Taylor. For those interested in the technical aspects, Madeleine is a ‘very pretty useful addition to Stephanie 6’ and is available, of course, from Daz. 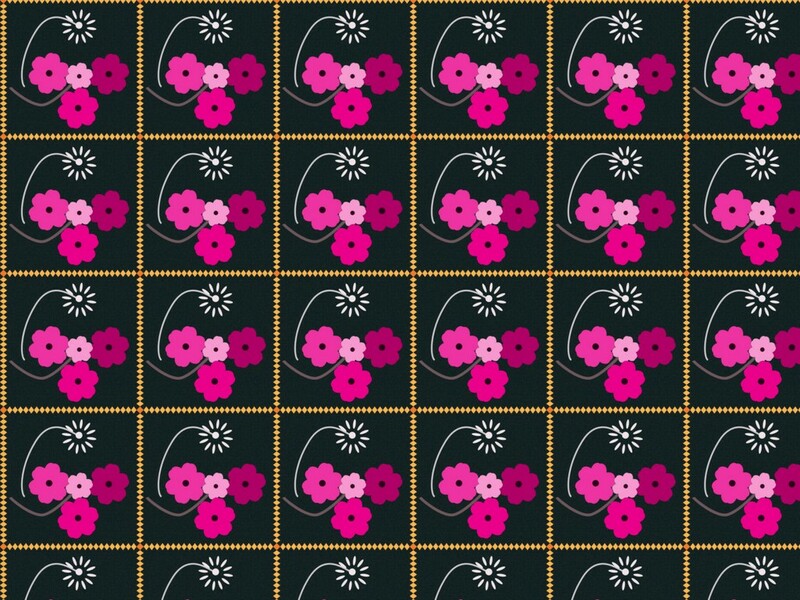 This is most definitely a mid-century pattern and designs similar to this would have been seen on the work and business clothes of many women at that time. The pattern is a simple one of a flower and is one of the few times that you will catch me using proper floral motifs which those who know me know that I particularly dislike. 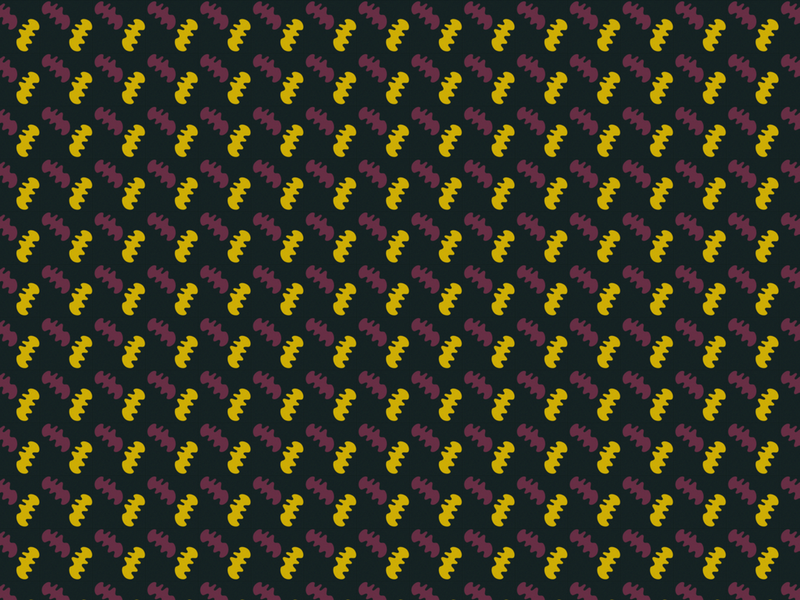 As with the image yesterday, this pattern was made in Adobe Illustrator and the image was modelled in Daz 4.7 using my normal seaside set but a different Genesis 2 model. This is not really a mid-century pattern although I have no doubt that a pattern like this would have been produced at that time. The inspiration for this pattern came simply because when I sat down to begin a new design but, instead of looking through the pattern samples that I have, I began to make this pattern purely from my own imagination. I have selected two colours to bring you because I was unable to decide which of the two colours I thought was the best. 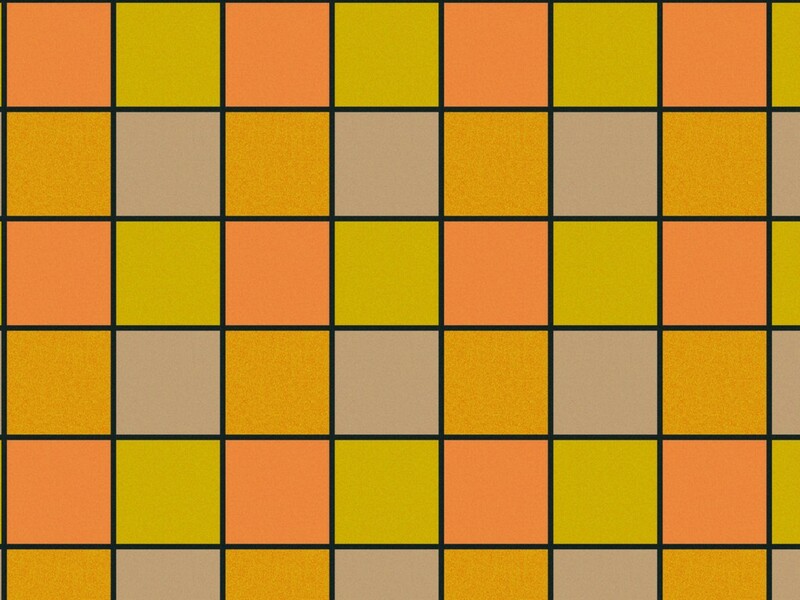 To make the motif of the pattern quite clear I have also included a mosaic swatch. This pattern was made in Adobe Illustrator and the image was created in Daz 4.7 using my normal seaside set but a different Genesis 2 model which is, in fact, Taylor. The dress is a new addition from Daz called the Skater dress. We are well and truly in the 1970s now with this eye-catching, highly conspicuous and quite extravagant wallpaper shown here in the mid-century room. To modern tastes this room looks way over the top but as patterns became more colourful and more riotous they became more acceptable and people enjoyed the change from the often wishy-washy papers of their parents. It was a time of making statements and one way to show that you were a modern family was to have a very modern wallpaper. Once again I have shown the wallpaper on one wall only because to show it on both would be far too overpowering for modern day taste although, at the time, often the design was used on all four walls – wow! 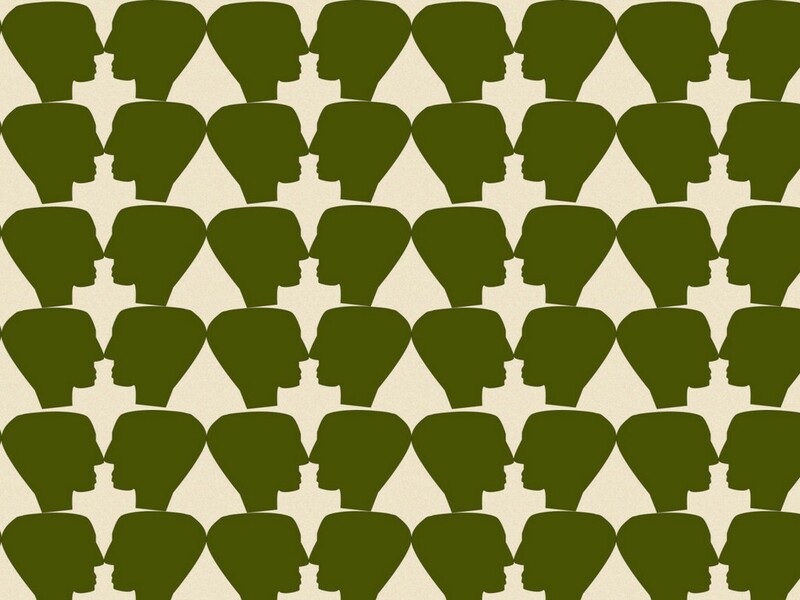 I have to admit that I quite like this pattern and, using perhaps more modern and restrained colours, it would make a pleasant wallpaper for a feature wall in a modern house of today. Another stunning and very 1960s pattern capturing the essence of what the artists of the late 1960s inspired and embodied. Simple but elegant squares with a black border – what could be easier and simpler? But the effect in the mid-60s was electric and the design was an instant fashion sensation. For this pattern I have used mid-century colours of Canary, Marigold, Oxlip, Light Stone and of course black. The dress is the Young Lady dress from Daz, the model is a Genesis 2 and the image was created in Daz 4.7 using my normal seaside set. 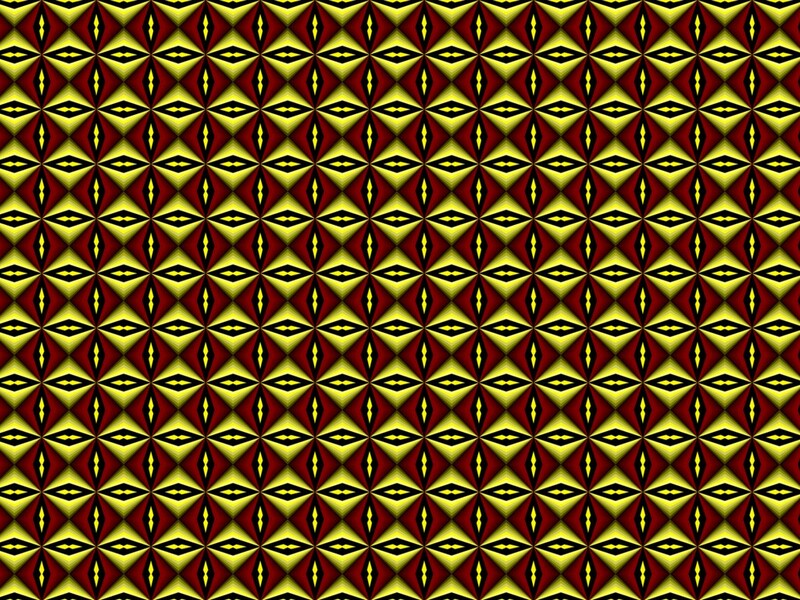 The pattern was made in Xara Designer 9. This is a stunning but very simple mid-century inspired dress pattern shown here on the Paige dress using the seaside set. The motifs are mid-century and the colours are black cotton background with Regal Red and Canary Yellow for the motifs – all British Standard colours. Today we have a wallpaper design in the mid-century room that is intended to be reminiscent of the patterns that were made in the late 1960s. This design looks at the type of motifs that were used as well as the colouring and the scale of the paper to produce something which is, for today’s market, quite eye-catching. But this was nothing compared to some of the designs produced as the decade changed. 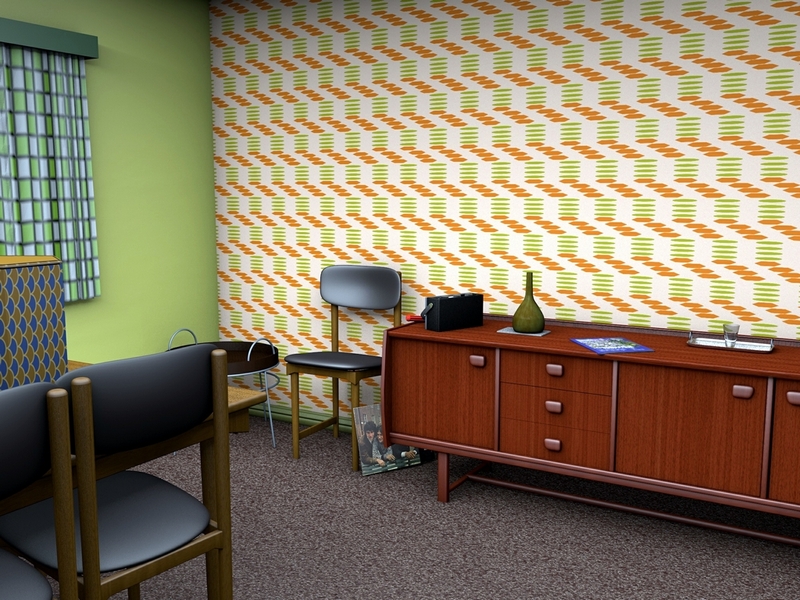 The mid-century room shows this wallpaper off well and it gives a good idea of what a room like this would have been like. I have refrained from using the same paper on both of the walls although at that time this would have been an option that was considered. 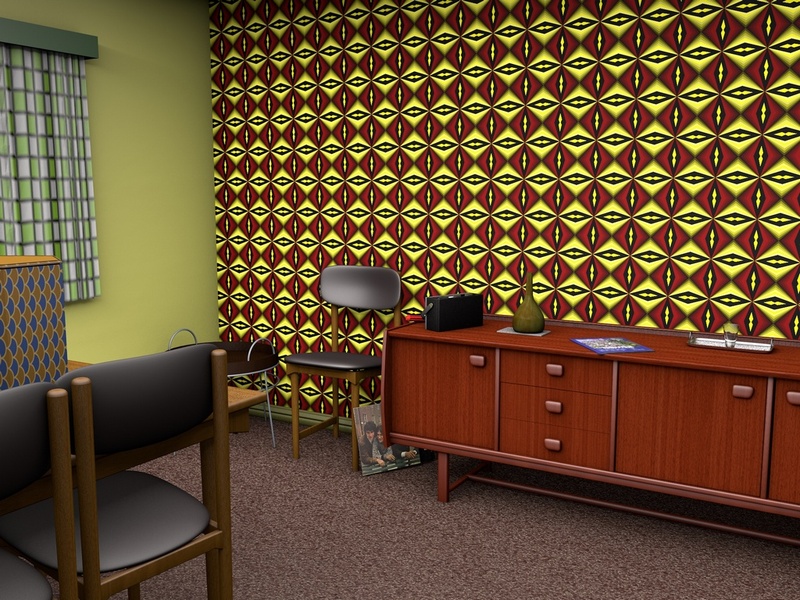 I think that this room, decorated this way, gives a good idea of the sort of rooms that were found in most people’s houses in the late 1960s. I feel that it is a room that I could quite happily walk into and feel at home. The image was created using my usual wallpaper set in Cinema 4D and the design was made in Xara Designer.